A varied range of light, medium and heavy duty 2 & 4 wheeled box dollies and skids. 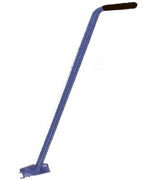 To help you to move awkward or heavy items safely around the workplace and office etc. All products are a fully welded construction and are finished in a durable and hardwearing polymer powder coating. This is our standard range only, we will make bespoke items to order, so if you do not see anything to suit your requirements please contact Liftsafe Directs sales team. Versatile light duty Box Dolly constructed from angled steel with reinforcing struts. Twin wheel castors. Angle steel frame, fitted with a 18 mm treated timber deck. 4 x swivel castors.. Angle steel frame, 18mm timber deck covered with black rubber non slip matting also fitted with 4 swivel castors. These dollies are ideally suited for the P.V.C window trade and will allow you to carry 3 tonne per set on their 150mm nylon swivel castors, the dolly also has a pair of grab handles for easy manoeuvrability around the workshop. Suitable for most applications, this versatile little piano skid has 200 mm steel centered wheels and includes rubber grips on both ends. Wheel skate Designed to hold a single round flange maximum width 200mm. Handle accessory for the box dolly. Made from tubular steel with rubber grip. Easily attachable. Sold in sets of 4, rolling corners allow large items to be moved with little effort. Highly manoeuvrable support for large cylindrical loads with four curved support straps provided. Strong all steel construction with sloping end frames for easy loading with protective side guards. Steel platform with 4 swivel castors. 75mm diameter wheels and grey non marking tyres. 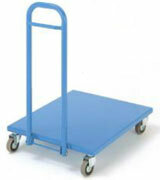 300kg dollies to suit most industrial needs. Steel frame construction with a choice of deck types.